Step-by-step poster guide to inoculating soybean using LegumeFix. Developed in partnership with N2Africa and PROMAC. 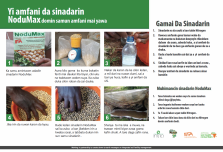 A3 poster illustrating how to inoculate legumes. Produced at a write-shop in Kenya facilitated by ASHC.